Boise playwright Heidi Kraay has a lot to celebrate these days. This weekend marks the end of the two-week run of “DIRT,” her most recent production. Without giving too much away, it’s the story of a flashy new medical company that makes a product promising health and longevity for its Boise clients. Click "play" to hear the audio version of this story. 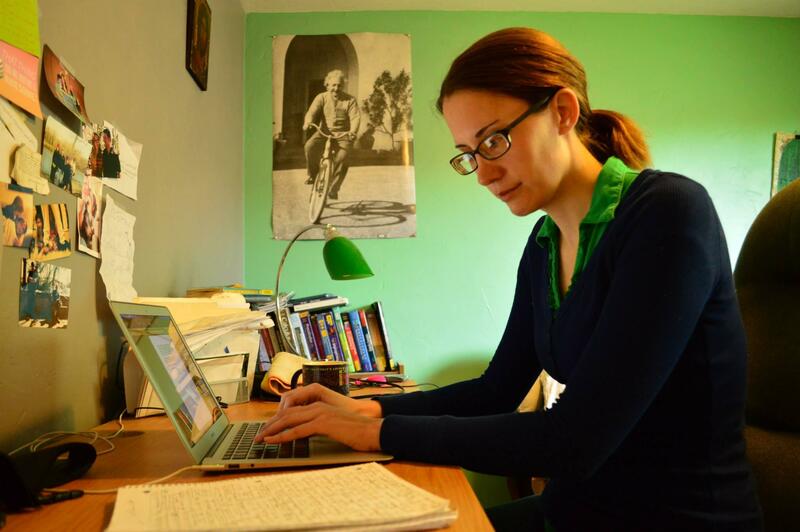 Playwright Heidi Kraay at work in her home office. The avant-garde show is smart, funny and dark -- and is the culmination of an idea Kraay’s been working on for years. Although her name is at the top of the billing for “DIRT,” the young playwright is quick to share the spotlight with her collaborators at Boise’s HomeGrown Theatre. Kraay (back to camera) watches HomeGrown Theatre actors rehearse her latest play, "DIRT." Kraay seems to constantly be in motion, juggling multiple projects at a time. Besides crafting new work, she’s helping to bring up the next generation of Boise theater stars. As much as loves doing theater, Kraay has an equal love of teaching it. 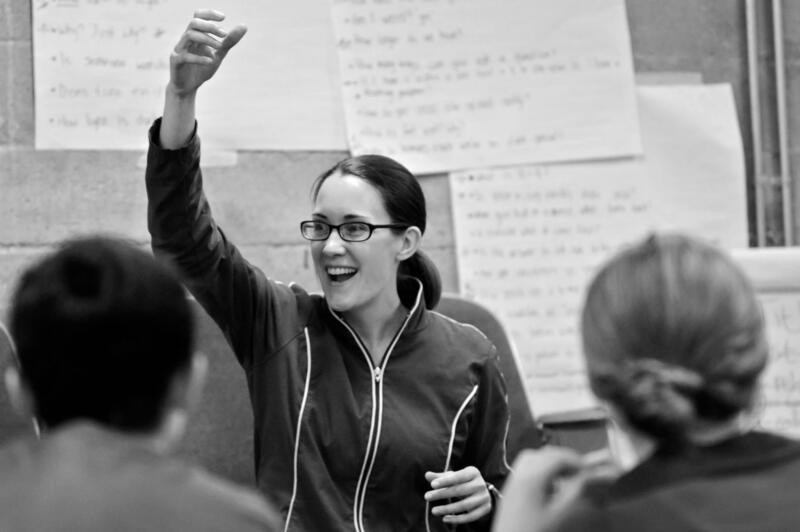 She works with teens at Boise Contemporary Theater’s after school program, guiding them as they write, produce and perform their own original play in just a matter of weeks. Kraay teaches kids at Boise Contemporary Theater. She also works with students at The Cabin Literary Center. Kraay says she’s impressed by their passion and work ethic, and it inspires her to keep honing her craft. To do that, Kraay has to write -- a lot. Every day she does writing exercises. She’ll set a timer and open up a notebook, and then she lets her mind loose on the blank page. Some days she writes a poem, a scene for a play she’s working on, or self-reflections on her art. The emerging artist has saved pretty much everything she’s ever written in her 30 years. There’s stacks of notebooks on her home-office floor, and boxes of them in her garage. Kraay says she’s learning to be less self-critical as a writer, and to trust her gut. She says part of her purpose as an artist is to figure out how to be a better person -- and being hypercritical would detract from that. That growing confidence is gaining her respect in Boise’s theater community, as more of her work is put out in the world for critique. “Unlike a lot of writers, she’s not hypersensitive and she doesn’t get defensive about [getting critique]," says Boise State theater arts professor Michael Baltzell. "I think that helps her grow." Baltzell taught Heidi, and has watched her evolve as an artist since then. Baltzell says Kraay’s versatility as a writer and teacher will help give her staying power. But when asked whether she should stay in Boise, he does have a gentle suggestion. Kraay (second from right) during a reading of "DIRT" earlier this spring. Also pictured is actor Sarah Gardner (far left) and director Kyle Barrow (far right). In August, Kraay will take Baltzell's advice. She’s been accepted into a master's program in San Francisco, and she’ll be splitting time between their and Boise. Click "play" to hear more about Kraay's relationship to Boise. The choice to go back to school is a practical one. Kraay says having her master's will help her teach at the college level. And there’s another reason. Kraay’s fearless about change. Her dad was in the Navy and her family moved every couple of years. For most of her life, change was the norm. Kraay says it’s also hard to see staying in Boise forever. She says she’s aware of the dangers of standing still too long as an artist, and she’s ready for the next challenge. If that means leaving Boise -- even if just for a little while -- she’s OK with that. Today’s profile is the second in a series we’re calling “Artist Statement.” The Boise City Department of Arts and History is providing funding for this project. Tune in next Friday for a profile of a burlesque dancing performance artist. You can also check out more about this project on Tumblr and tweet to @FABarnhill using the hashtag #BoiseArts. On Friday, KBSX will begin a series of stories on five emerging Boise artists. We’re calling the series “Artist Statement.” I won a grant from the Boise City Arts and History Department to produce these stories. To learn more about the series, I sat down with Scott Graf to explain why we're telling these stories, and what you can expect over the next five weeks. Q: Where did you get the idea for this series?